Roughly 30 paratroopers of the U.S. 82nd “All Americans” and 101st Air­borne “Screaming Eagles” Divi­sions landed at Sainte-Mère-Église in the wee hours of June 6, rein­forced at day­break by another unit of U.S. infan­try. The lightly armed soldiers held the town, garri­soned by Germans, until rein­forced by armor moving up from nearby Utah Beach in the after­noon of June 7. Today hanging from the church steeple is a life-size effigy of Pvt. John Steele, whose canopy snagged the spire, leaving him dangling for two hours as one of two wit­nesses to the car­nage taking place in the church­yard below, lighted by a house fire that made the descending para­troopers easy targets for the German defenders. (Steele pre­tended to be dead.) The effigy is a per­ma­nent memo­rial to the brave Amer­i­cans who liberated the first town in France. Although the 82nd Air­borne had taken its chief objec­tive, it had landed close to German units and would suffer numer­ous coun­ter­attacks. Mean­while, the size­able bridge­head estab­lished by the Allies’ pre­cisely timed air, naval, and am­phib­ious “shock and shatter” attacks over­whelmed the static German coastal defenses. The three British and Cana­dian beaches (Gold, Juno, and Sword) were joined together on June 7, and a day later they linked up with Omaha Beach. By June 12 Utah Beach was incor­po­rated with­in the 50‑mile front. How­ever, the Nor­man bocage and its maze of thick, tall hedge­rows behind the beaches bogged down follow-on opera­tions, not helped by an increas­ingly deter­mined German defense that slowed Allied progress in the West. In the East the Soviets launched their major sum­mer offen­sive, dubbed Oper­a­tion Bagra­tion, throwing 2.5 mil­lion men, 5,200 tanks, and 5,300 air­craft at German Army Group Center. On July 1, Adolf Hitler’s chief of staff at German Supreme Head­quarters in Berlin, Field Marshal Wilhelm Keitel, tele­phoned Field Marshal Gerd von Rund­stedt, com­man­der in chief of German forces in France, seeking advice on what to do. Von Rundstedt did not mince words: “The writing [is] on the wall, make peace you fools.” Less than a month later von Rundstedt was relieved of his command. 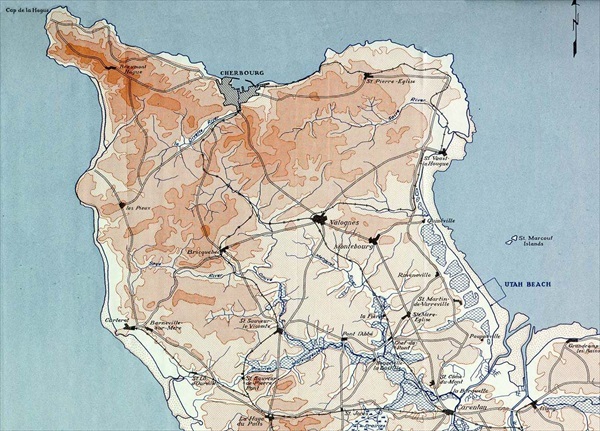 Above: Map of Cotentin Peninsula showing the location of Utah Beach, the cross­roads town of Sainte-Mère-Église roughly 6 miles to the rear of the U.S. landing beach (admittedly hard to see), and the port of Cher­bourg near the northern tip of the peninsula. Like Sainte-Mère-Église, Cher­bourg was at the top of the list of U.S. objec­tives in the first days of Oper­a­tion Over­lord because the port city lay a little over 70 nauti­cal miles from the logis­tic ports in England. On June 24, U.S. troops entered Cher­bourg against fierce oppo­si­tion; three days later the city was declared secured. Left: Bocage country on Nor­man­dy’s north-jutting Coten­tin Penin­sula, France. Bocage ter­rain is a mix­ture of wood­land and pas­ture, with fields and winding coun­try lanes sunken between nar­row low ridges and banks of ancient, thick hedge­rows that break the wind and limit soil erosion but also limit visi­bility. 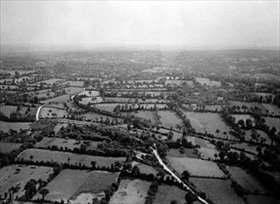 Bocage country (hedge­row country) made pro­gress against German defenders dif­fi­cult and dangerous for the Allies. Aerial bombing, bull­dozers, and tanks out­fitted with steel “teeth” welded to their fronts (former German tank obstacles scavenged from the Normandy beach­head) were used to bust through the vexing hedge­rows. The “inventor” of the hedge­row buster received the armed service’s Legion of Merit for his contribution to the success of the Normandy Campaign. 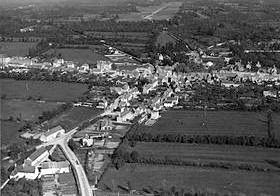 Right: Aerial view of Sainte-Mère-Église, Nor­man­dy, June 1944. 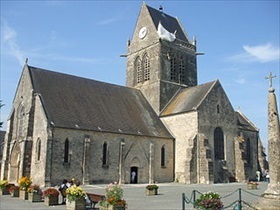 For the Ger­mans, Sainte-Mère-Église was the gate­way to Utah Beach. At 10 a.m., June 6, German attacks on the town began with a fury, and by early after­noon enemy armored columns were slam­ming the 505th Para­chute In­fan­try Regi­ment of the 82nd Air­borne Divi­sion from three direc­tions in an attempt to reach the vulnerable invasion beaches. Left: This church in Sainte-Mère-Église, with its para­chute memo­rial (the white drape on the roof of the bell tower), recalls the famous inci­dent involving 31‑year-old John Steele of the 505th Para­chute In­fan­try Regi­ment, whose chute caught on one of the back steeples of the church bell tower. (Steele was played by the Amer­i­can actor Red Buttons in the Academy Award-winning 1962 epic D‑Day film The Longest Day.) Taken prisoner by the Germans, Steele later escaped and rejoined his divi­sion. Another para­trooper, 17‑year-old Ken Rus­sell was also snagged by the roof, though his story is not as well known. Both wit­nessed their comrades, among them a ser­geant who attempted to res­cue them, being killed in the fire­fight that erupted early on June 6. Steele was awarded the Bronze Star for valor and the Purple Heart for being wounded later in com­bat. Upon com­pleting oper­a­tions in the Sainte-Mère-Église area, the 505th Para­chute In­fan­try Regi­ment was awarded the Presidential Unit Citation. 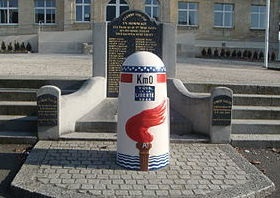 Right: This marker in Sainte-Mère-Église, Km 0, is recog­nized by French­men as the com­mence­ment point for their coun­try’s libe­ra­tion from Nazi Germany (Borne 0, point de départ de la voie de la Liberté). In the Normandy Cam­paign alone, 15,000 French civil­ians died either from Allied bombings or in com­bat opera­tions between Allied (including French Resistance fighters) and German ground forces.